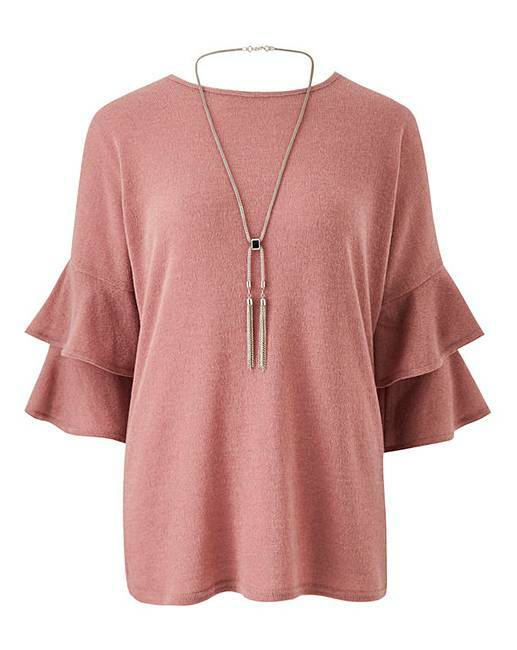 Frill Sleeve Top with Necklace is rated 5.0 out of 5 by 4. A stretch jersey tunic printed in a neutral coloured paisley design. It has three-quarter-length sleeves with a frill detail to the cuff. Rated 5 out of 5 by Liverbird from great features Very pleased with this top. Sleeves are just the right length and sit well. Slight shaping to body of jumper, just enough to flatter without clinging. Necklace an added bonus which can be worn with other tops. Happy shopper! Rated 5 out of 5 by Debi from Nicely styled top Nice top, fits well and loving the sleeve design. Not washed yet so will be interesting to see how it washes.